This work relates to the Great War and the following section will, primarily, only record memorials and commemorations of WW1. Divisional memorials will be included. 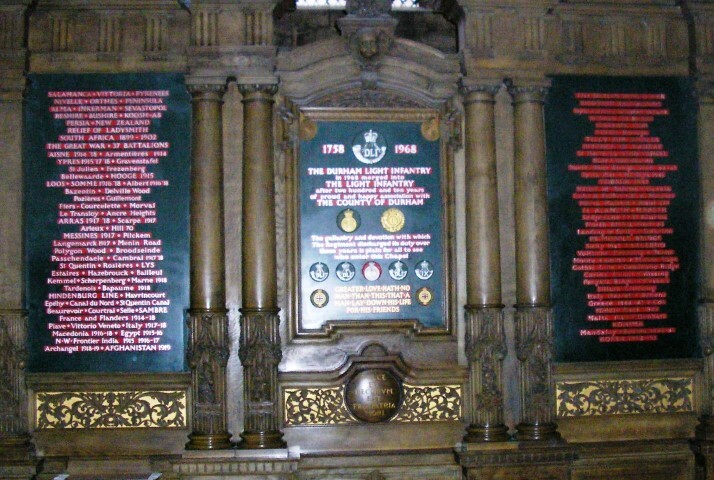 In 1922, the Regiment’s officers and the Cathedral Chapter resolved to create a memorial chapel in the south transept. The Bishop of Durham, Hensley Henson dedicated the Chapel 20 October 1923. For 200 years, new Colours had been presented in religious services. When disposing of the old Colours a church became their natural final resting place. 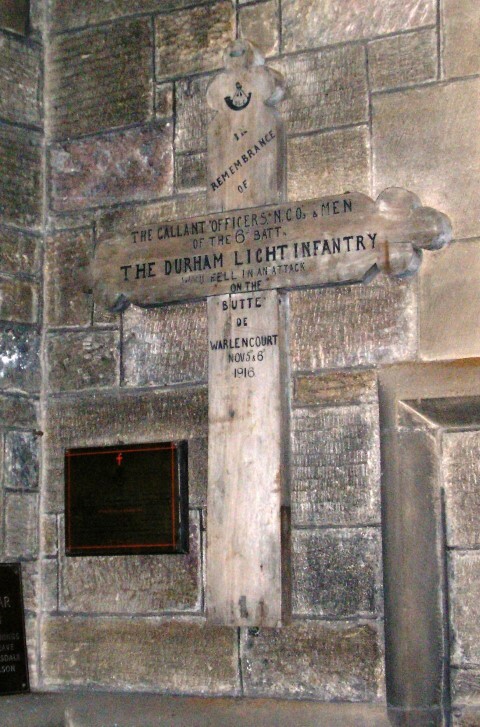 Most of the DLI’s old Colours are in Durham Cathedral but there are some in Parish Churches elsewhere such as Barnard Castle. To past and serving soldiers the Colours lay at the heart of the regiment, the Queen’s Colour signifies loyalty and service to the monarch and the Regimental Colour represents the soldier’s duty to the regiment. The Colours bear the battle honours from the Peninsula War to Korea. 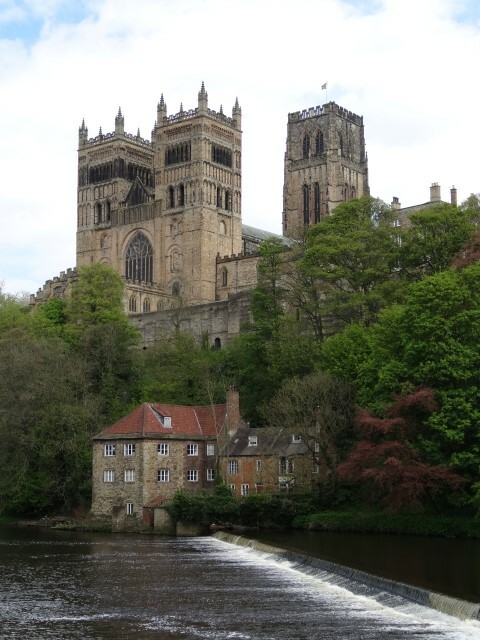 On 12 December 1968, after a final parade on Palace Green, the 2 Colours of the DLI were laid up in Durham Cathedral. This ceremony marked the end of the DLI. More than 12,600 names fill the book for the First World War. The pages are turned daily as the books are in date order. Casualties are recorded on the date they died. 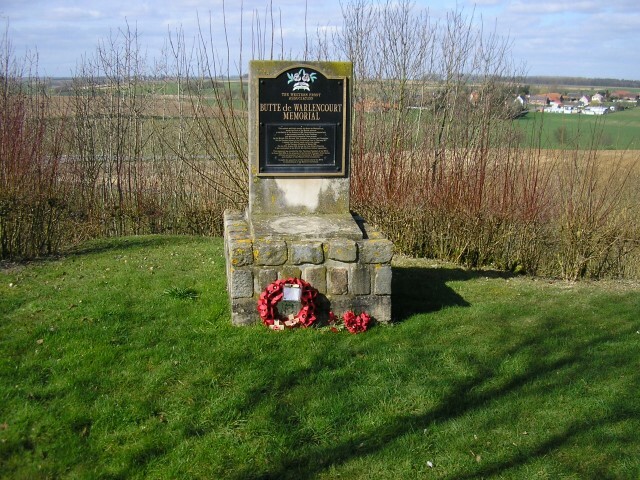 It commemorates the action of the 151st Brigade during the last days of the Battle of the Somme and the attack on the Butte de Warlencourt 5 November 1916. Following 2 failed attempts by the British Army, the 151st Brigade – the 6th 8th and 9th DLI attacked the fortified mound. The weather was terrible and the heavy rain turned the trenches into quagmires. The Germans increased their counter-attacks and despite staunch and courageous resistance by all 3 battalions, they could not prevent the withdrawal of the survivors from captured trenches after midnight. More than 800 men were killed, wounded and missing. The horrific mud claimed many victims as they struggled to get out of the trenches. It took another 3 months before the Butte was finally taken. The cross was made and erected by the Regimental Pioneers of the 9/DLI using scrap wood they could find. 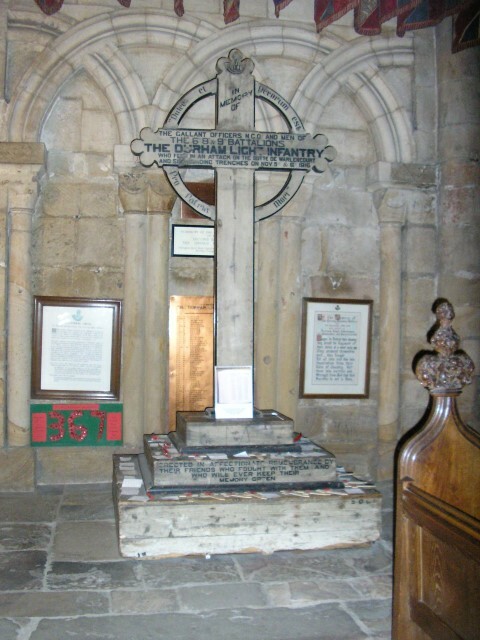 The cross stood on the battlefield until it was removed in 1926 and then placed in the chapel in February 1927. Another 2 smaller crosses were erected to commemorate the 6th and 8th Battalions and they stood together on the Butte de Warlencourt battlefield until they were removed in 1926. 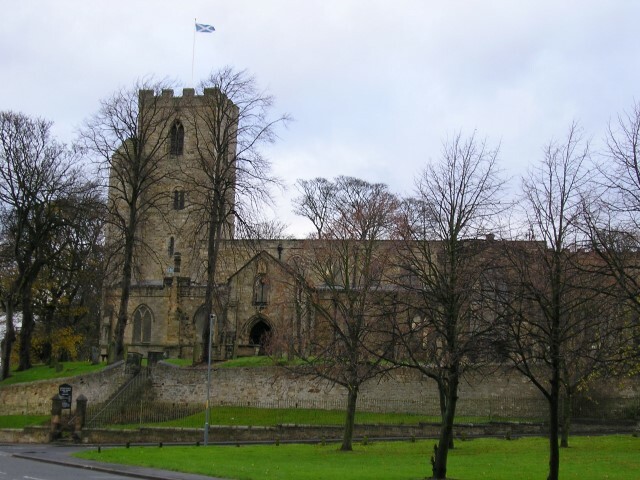 In February 1927, the large cross was then placed in the DLI Chapel and the other crosses were placed in St. Andrew’s Church, South Church, Bishop Auckland and the St. Mary’s and St. Cuthbert’s Church, Chester-le-Street. 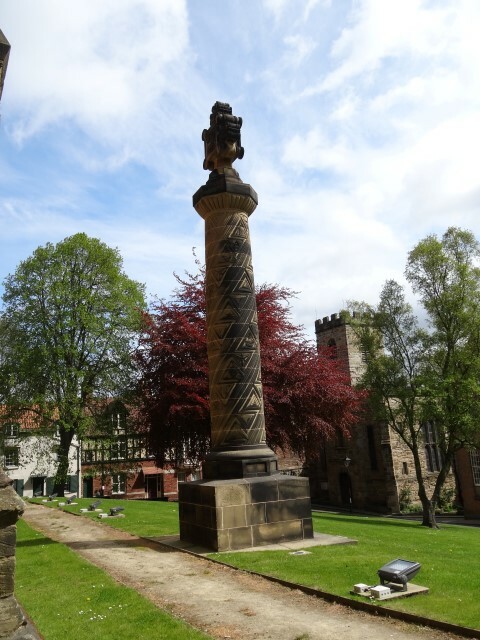 A column in the Norman style is located to the east of the Cathedral, within its grounds. 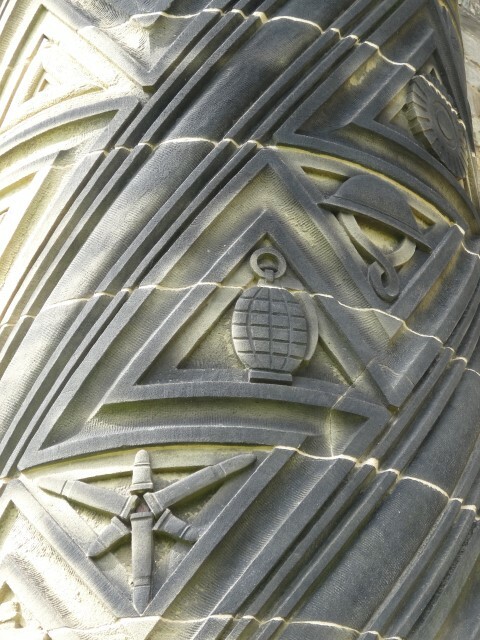 It is carved with designs of military artefacts such as Mills bomb, shells, steel helmets. The inscription simply states DLI 1914-1918. It was unveiled 24 November 1928 by the Lord Lieutenant, the Marques of Londonderry. Two memorial plaques were dedicated 30 June 1990. One plaque with an inscription in English and the logo of the Western Front Association (WFA) was unveiled by the WFA President John Terraine. The second plaque, inscribed in French and in the colours of the Souvenir Francais, faced the battlefields of the French Sixth Army. This second plaque was unveiled by M. Andre Coilliot, of the Souvenir Francais. 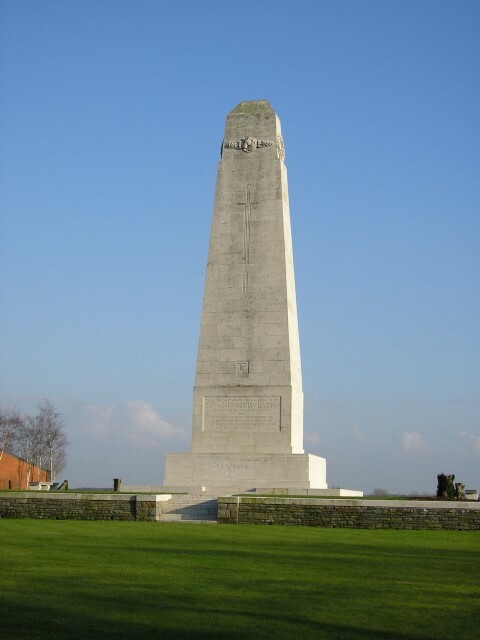 The 55ft tall obelisk was unveiled 1 September 1929 by Field-Marshal Lord Plumer. Ex-soldiers and relatives of men who had fallen attended the ceremony, which was held at 11 a.m, and followed by the Last Post and a minute’s silence. The memorial is set within a low wall within a lawned area, entered by a gate set in stone pillars, somewhat similar in appearance to many CWGC cemetery entrance gates. It was designed by Captain Mauchlen MC, 9/DLI, an officer who had served with the Division. “To the enduring memory of all ranks of the 50th Northumbrian Division who fell in the Great War 1914-1918 and in memory of their comrades of the same Division who gave their lives in the War of 1939-1945 for the Liberation of France, Belgium and Holland”. Above this is the Divisional emblem, two capital letter T’s, signifying the Rivers Tyne and Tees. A sword is engraved above, with a representation of a horse’s head looking out from laurel wreaths right at the top. 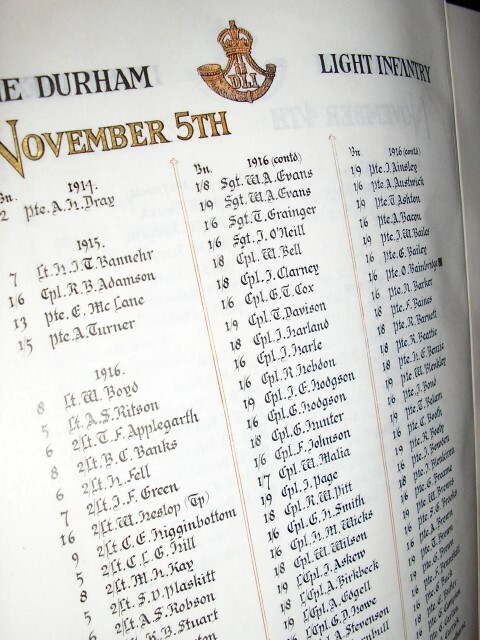 On the two sides are listed the units which made up this Division, which were the 149th (Northumberland), 150th (York and Durham) and 151st (Durham Light Infantry) Infantry Brigades, plus associated cavalry, artillery and other Divisional units. The actual battalions listed within the infantry brigades do not in fact reflect all the units that were part of the 50th throughout the Great War. The memorial to the 20th (Light) Division is at Guillemont on the Somme. 11/DLI came under the orders of the 61st Brigade until January 1915 and thenceforth was a Pioneer Battalion. There is another (obelisk) memorial at Langemarck near Ypres.